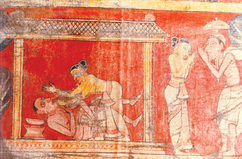 Here is an occasion in which the female asserts herself over her aged husband in the Vessantara Jataka (one of the former birth stories of the Buddha). It is painted with great animation in this 18th century A.D., scroll painting found at the Arattana Vihare, Hanguranketa, Sri Lanka. Sirima Kiribamune, "A woman asserting her self over her aged husband," online in Digital Library for International Research Archive, Item #12654, http://www.dlir.org/archive/items/show/12654 (accessed April 18, 2019).